Survivor: San Juan del Sur (2014) - 7th place, 11th out - 5th juror. Cumulative time: In-game - 30.5 days; Exile Island - 2 days (1 visit). Voted out in Episode 12, "Still Holdin' On" (Day 32). San Juan del Sur Ep. 2 IC: "Sumo at Sea" - Loses in his bout against Drew, and Coyopa loses again, 5-4. San Juan del Sur Ep. 3 IC: "Game of Throw-Ins" - Paired with Wes, who scores vs. Missy/Julie, but not Jon/Natalie, and Coyopa loses again, 3-2. San Juan del Sur Ep. 4 IC: "The Cruel Sea" - Swims for Coyopa, and thanks to Drew's shenanigans, Coyopa wins! San Juan del Sur Ep. 5 IC: "Shakedown Street" - Now with New Hunahpu, and Hunahpu wins, easily. San Juan del Sur Ep. 6 IC: "Flips, Flops & Flags" - Helps push the cube, watches the puzzle, and Hunahpu wins. San Juan del Sur Ep. 8 RC: "Long Road to Ruins" - With Josh, Jon, Jaclyn, and Baylor, loses by a lot. San Juan del Sur Ep. 9 RC: "Shake It Off" - Loses in his bout vs. Keith, but his team wins anyway, 5-4. San Juan del Sur Ep. 10 RC: "Dirty Water Dog" - With Reed, Jon, and Jaclyn, cruises to an easy reward win. San Juan del Sur Ep. 7 IC: "Take the Reins" - Sixth to drop out, makes second round (7th/12). San Juan del Sur Ep. 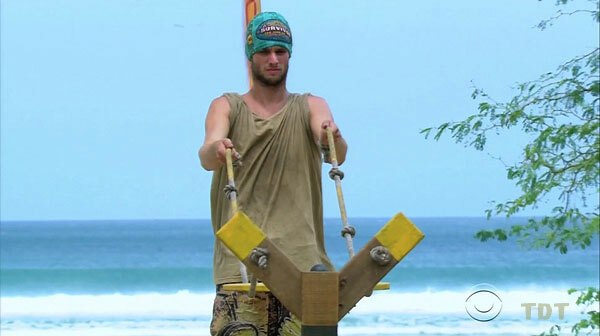 8 IC: "My Poor Brain" - With Wes, tied for 3rd eliminated, on the fourth item in the 1st round (tie-8th/11). San Juan del Sur Ep. 10 IC: "Uncomfortably Numb" - Resists all food offers, but is seventh to drop out, at the 90-minute mark (3rd/9). San Juan del Sur Ep. 11 RC: "Crush" - Answers both questions he can correctly, swiftly eliminated (7th/8). San Juan del Sur Ep. 11 IC: "Paddle Out" - One of several people still trying to land their first ball (tie-5th/8). San Juan del Sur Ep. 12 RC: "Ballin' A Jack" - Out in seven seconds (7th/7). San Juan del Sur Ep. 12 IC: "A Bit Tipsy" - Not even close (7th/7). 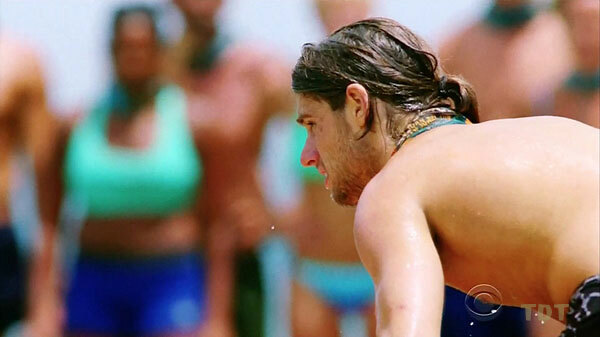 San Juan del Sur, Ep.1: Nadiya Anderson (voted out, 5-3-1). San Juan del Sur, Ep. 2: Val Collins (voted out, 4-4 [5-1 on revote]). San Juan del Sur, Ep. 3: John Rocker (voted out, 5-2). San Juan del Sur, Ep. 12: Four votes, from Natalie, Baylor, Keith, and Missy (voted out, 4-3). San Juan del Sur, Ep. 14: Voted for Natalie Anderson (who won, 5-2-1). Arrival at Exile Arena, with Drew. Morning 1. Day 1, we made fire! First hashtag. *sniff* They grow up so fast. Voting me out was your biggest move, Natalie? Cool! 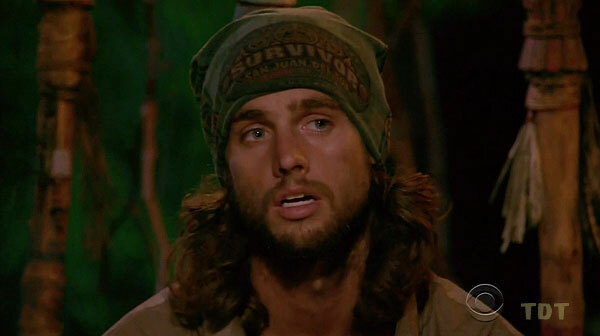 Dalton Ross at EW.com (9/10/14): "The new Survivor players reveal if they would vote out their own loved ones"
Gordon Holmes at XfinityTV.com (12/5/14): "Alec - 'I Don't Not Like Baylor'"
Rob Cesternino at RHAP (12/4/14): "Exit Interview with the Latest Two Players Voted out - 12/04/14"
Josh Wigler at Parade.com (12/4/14): "Survivor Player Alec Christy 'Meats' His Maker"
Inspiration in Life: My dad because he has shown me how to be a man. He has coached me when I needed it most. He works hard but doesn’t ever let that get in the way of being a dad. My dad has just always been there for me. Hobbies: Fishing, lacrosse and surfing. Pet Peeves: People who say they don’t like something they’ve never tried. 3 Words to Describe You: Athletic, outgoing and charismatic. Reason for Being on Survivor: Winning the million dollars. Why You Think You’ll “Survive” Survivor: I have no fear. Why You Think You Will Be the Sole Survivor: I am smart, determined, fit and have skills that could help me win the game. What Does It Mean to You to Play Survivor with Your Loved One? Playing Survivor with Drew is awesome because we are very competitive, so it will be exciting to see who can last longer. Sharing this experience is going to be incredible as we both compete against one another and support each other at the same time. It's going to be interesting to play a game where it could literally go either way, and you never know who will go further in it."